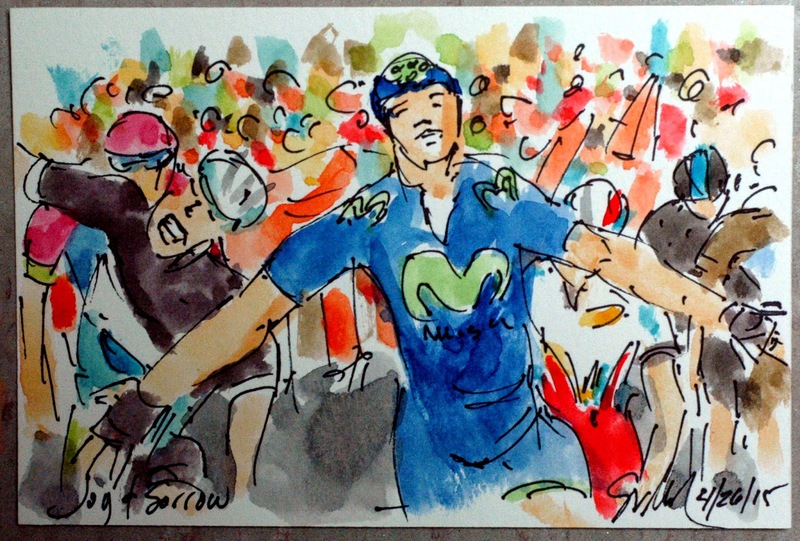 Great joy crossed the face of Alejandro Valverde (Movistar) as he raised his arms in a victory salute. Valverde claimed is third career win in the last of the spring Monuments and in so doing, paid back all of the efforts his team had put into the race. 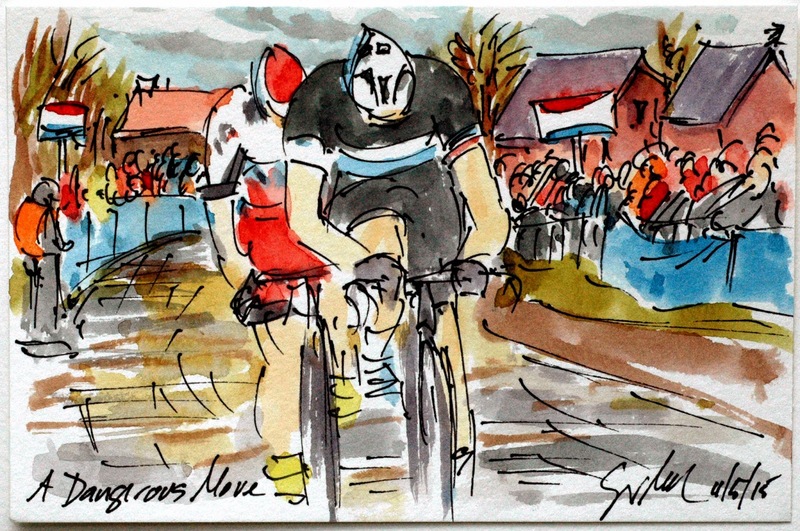 The sorrow and frustration was etched across the face of Julian Alaphilippe (Etixx Quickstep). The young Frenchman just ran out of road as he sprinted towards the line. Claiming the final position on the podium was Joaquim Rodriguez (Katusha) followed by Rui Costa (Lampre Merida) and Romain Bardet (AG2R). Bardet was able to recover from his earlier attack to still finish in the top five. Again, the renaissance of French cycling continues with ever more young Frenchmen getting better and better results. This is a small original watercolor and ink painting that is available through my artist website at www.greigleach.com. To purchase this particular painting just follow the direct link at the end of this post. With less than five kilometers left to race, it was time to ramp up the attacks. 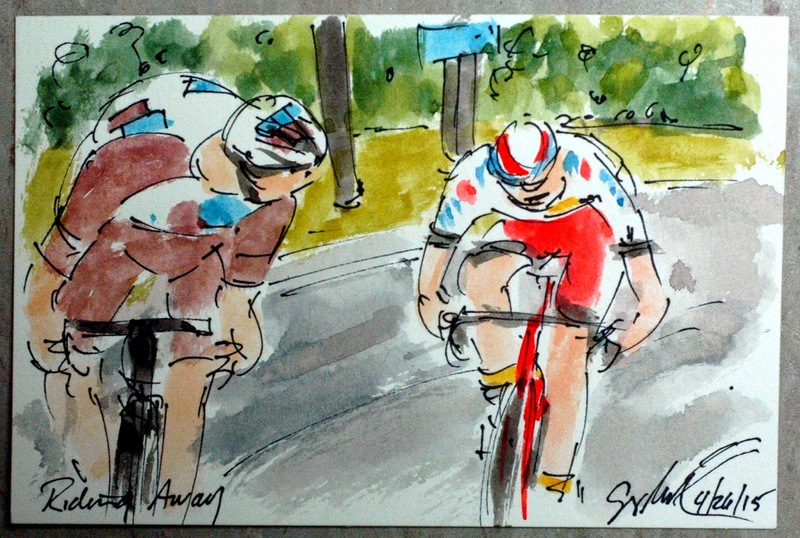 Next to stomp his pedals in anger was Romain Bardet (AG2R). Never one to let anybody get away, Giampaolo Caruso (Katusha) chased the fleeing Frenchman down. Caruso's efforts brought the remnants of the peloton back together, yet again. Setting up to what looked to be a hard sprint up the Cote d'Ans to the line. 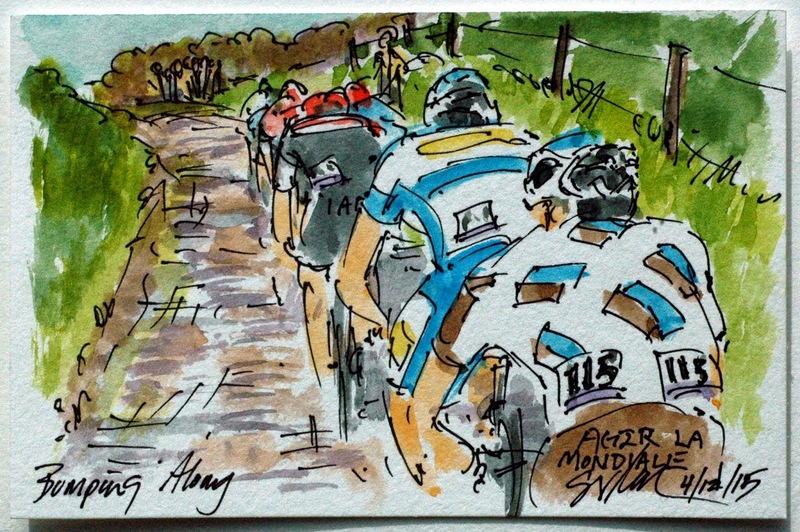 With moves and counter moves being pulled back into the peloton and multiple riders now with a better chance of pulling off the surprise victory, everyone thought they would play their cards for themselves and for their respective teams. 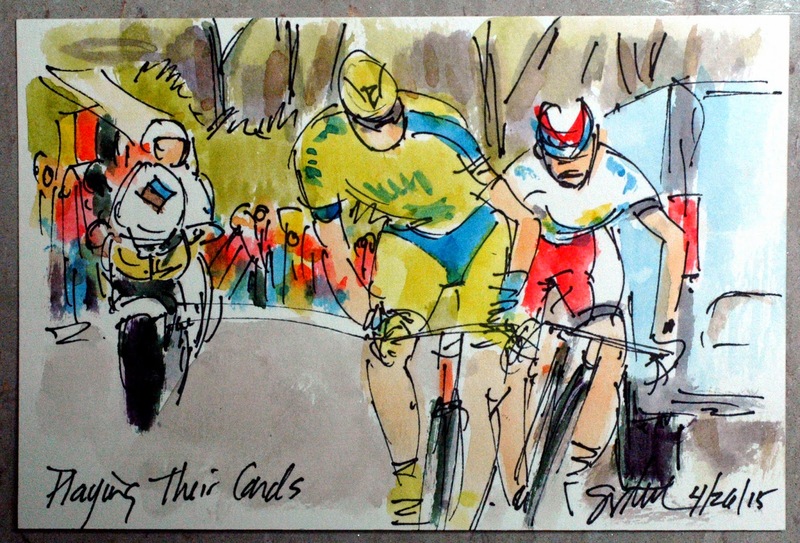 Romain Kreuziger (Tinkoff Saxo) went on the attack first, but his move was quickly covered by Giampaolo Caruso (Katusha) as the pair climbed the Cote de La Roche-aux-Faucons. Thousands turned out to watch their heroes climb, to drink beer and munch on the famous Frites. Simon Gerrans (Orica GreenEdge), wearing bib # 1 as the last winner of the race, crashed a second time inside of the last 40 kilometers of the race. Gerrans had been one of a huge pile up just a few kilometers earlier that ended the race for many of the big name contenders. 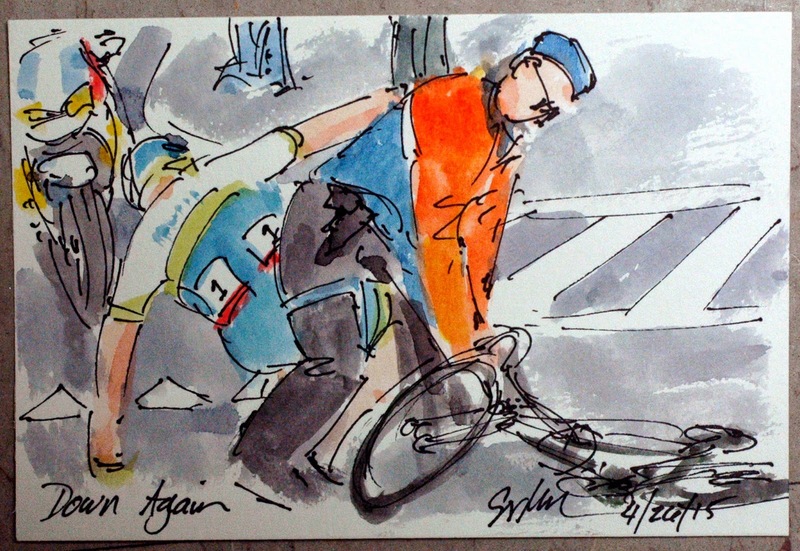 While Gerrans did manage to get back on the road from that, this crash was the one that made him hang up his cleats and any hope of repeating his race victory. Some of the others to end their day included the home town boy, Philippe Gilbert (BMC), Nicolas Roche (Sky) and Dan Martin (Cannondale Garmin). Poor Martin and Gilbert just can't catch a break, both have had crashes in their last two outings. Gerrans is being aided by one of the many police officers that help close the roads, control the crowds and protect the riders along the route. 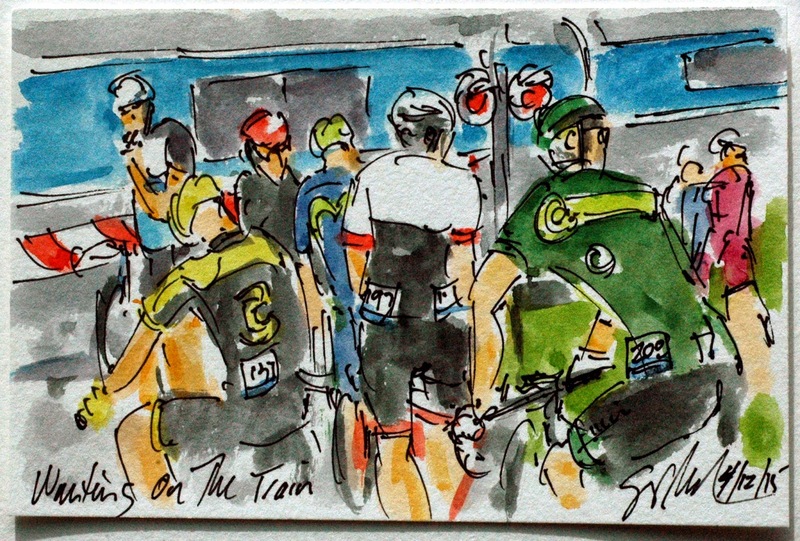 Life at the back of the peloton is a mixed back of struggling, mechanicals and other special cycling skills. Zdenek Stybar (Etixx Quickstep) is racing his arm to call forward his team car for some assistance. Riders will drop back to the rear of the peloton and signal the race director that they need some help from their team car, of course they have already talked with their Director Sportif via radio to let him know just what the problem is. Other riders like Mike Terpstra (Roompot) may be struggling to hold the pace of the group, while others like, Stephen Cummings (MTN Qhubeka) and Arnold Jeannesson (FDJ) are answering the call of nature. 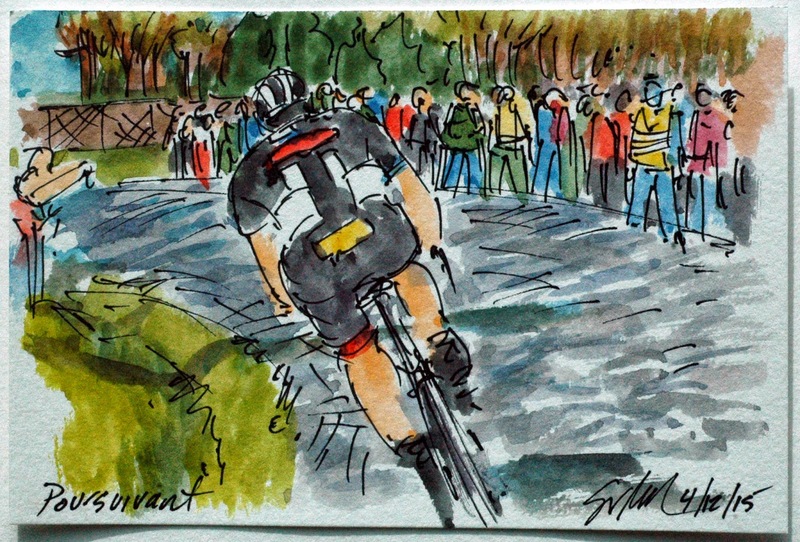 When the pace is on, riders will merely get out of the peloton, whip it out, and let the stream flow. So it is a courtesy to drop to the back, I imagine it isn't much fun to be in the slip stream of a rider who is relieving himself. When the pace is slow, or in a mutual agreement among the group, riders will actually stop along the side of the road for a "break naturale". Does that fit into the "too much information" category? Astana now has managed to get two of their riders off of the front of the peloton. Michele Scarponi and Tanel Kangert have been joined by Jhoan Chaves (Orica-GreenEdge), Romain Kreuziger (Tinkoff Saxo) and Julian David Arrendondo (Trek Factory Racing). The group, surprisingly, was able to build up a minute advantage on the following peloton as they ripped through the valley before the next leg zapping climb on their way to Ans. The weather forecast had called for rain throughout the day, and while the clouds continued to threaten the peloton, they managed to stay mostly dry. Astana came to the race with a purpose in mind. Not that every team doesn't want to win the race, Astana brought a very powerful team ready to work for last year's winner of the Tour de France, Vincenzo Nibali. One way to take pressure off of the rest of the team is to put at least one man into the breakaway. That way, the team is not expected to help chase down the break thus allowing the breakaway rider's teammates to hide out of the wind, while other teams do the hard work of chasing down the break. Once the peloton had almost caught the early morning break, it was Andriy Grivko who jumped out of the Astana led peloton to work for his fellow turquoise clad compatriots. 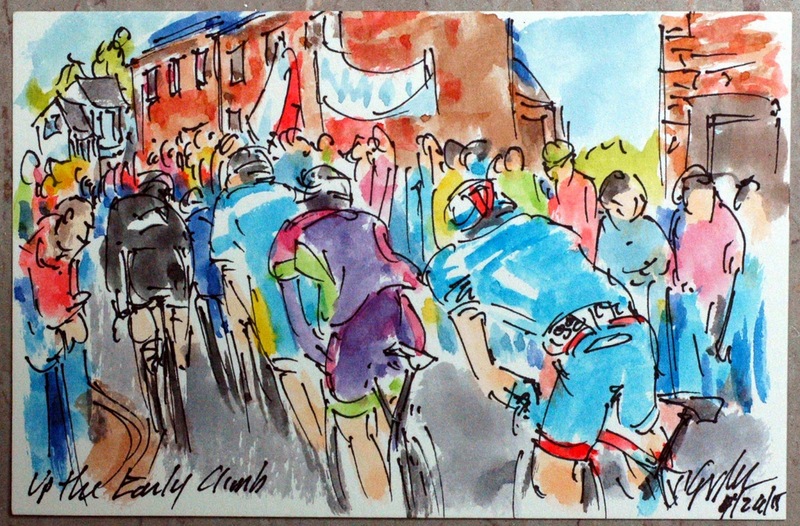 The 101st running of the Liege Bastogne Liege included the requiste early breakaway. This one was comprised of eight riders (although not are were visible). 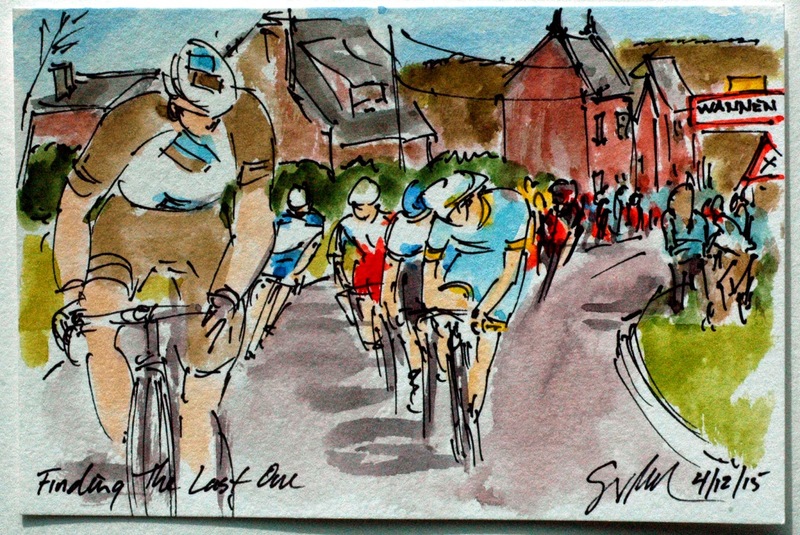 They are hitting the second of the ten categorized climbs that faced the peloton as they covered the 253 kilometers of the French speaking section of Belgium. The organizers of the race cruelly loaded all most all of the climbs in the back end of the race, including eight of the climbs in the last eighty kilometers of the day's racing. 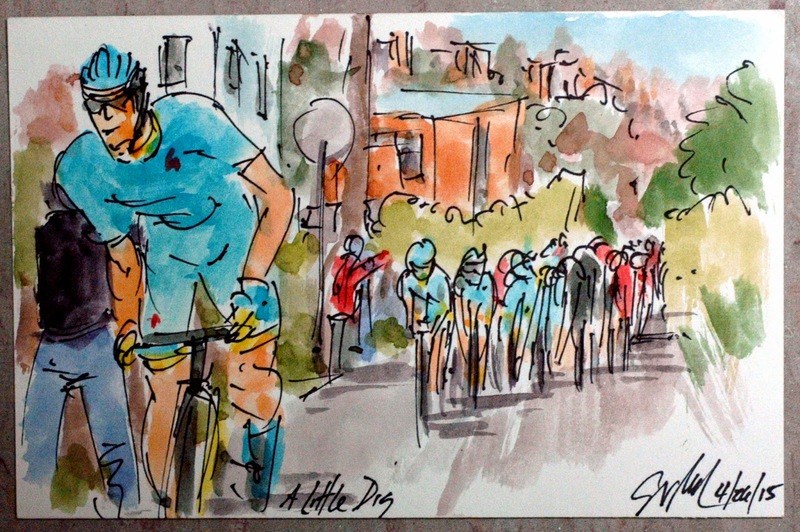 Thousand upon thousand of loyal cycling fans turned out to cheer on their heroes and foes alike with the largest numbers lining the climbs like the Cote Saint-Roch. 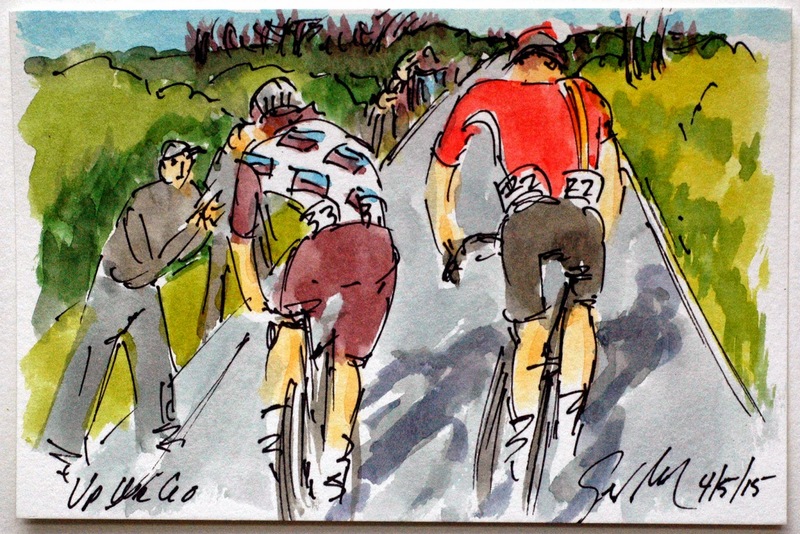 Mainus Minaard (Wanty Groupe Gilbert) follows Diego Ulissi (Lampre Merida) and Otto Vergaede (Topsport Vlaaderen) up the short steep climb with the rest of the break blending into the throngs yelling their encouragements (or swigging their beers). This is a small original watercolor and ink painting that was created using Yarka St. Petersburg watercolors and Steve Quiller brushes from www.richesonart.com. 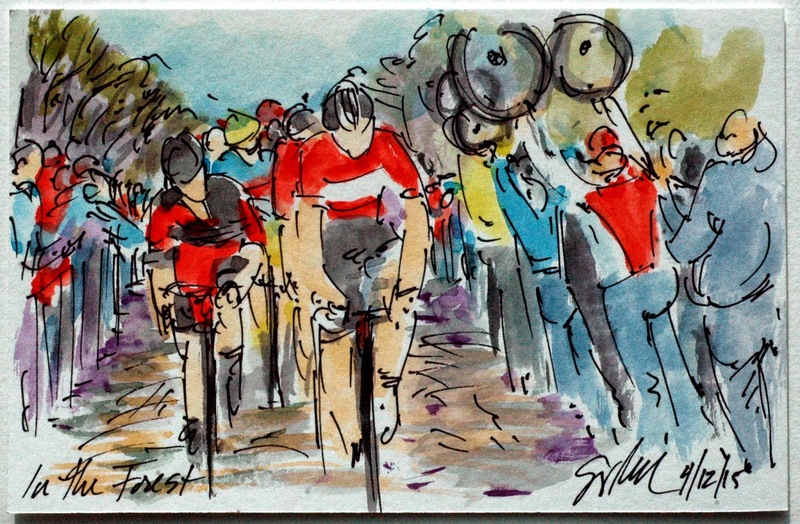 In addition this painting and most of my cycling art is available through my artist website at www.greigleach.com. To purchase this particular painting just follow the direct link at the end of this post. 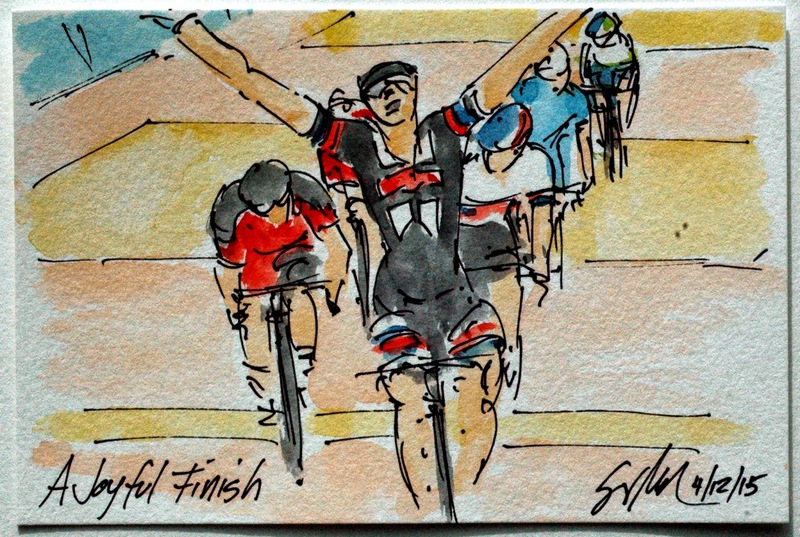 What happened in the bell lap was what everyone of the riders (except Degenkolb) feared, the strongest sprinter took the sprint out of the six men who contested for the line. So it was the John Degenkolb (Giant Alpecin) threw his arms in a joyful victory salute, moving one step up the podium from 2014. Zdenek Stybar (Etixx Quickstep) managed to just hold off Greg Van Avermaet (BMC) to grab second place with the Belgium claim the third step of the podium. Rounding out this group is Martin Elmiger (IAM Cycling), Lars Boom (Astana) and Jens Keukeleire (Orica GreenEdge). Just finishing this race is a victory, but winning it can make a career. This is a small original watercolor and ink painting that is available through my artist website at www.greigleach.com. To purchase this particular watercolor just follow the direct link at the end of this post. International shipping is available. 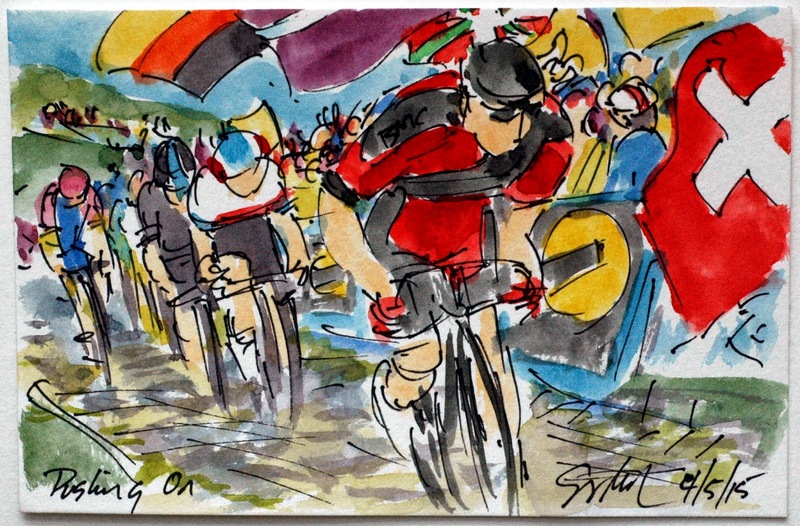 If you are enjoying reading about Paris Roubaix with the accompanying artwork, be sure to search out my recently published, "Book de Tour - Art of the 101st Tour de France". It can be found through most every online bookseller around the world. Google the title to discover where you can get a copy and avoid international shipping charges. 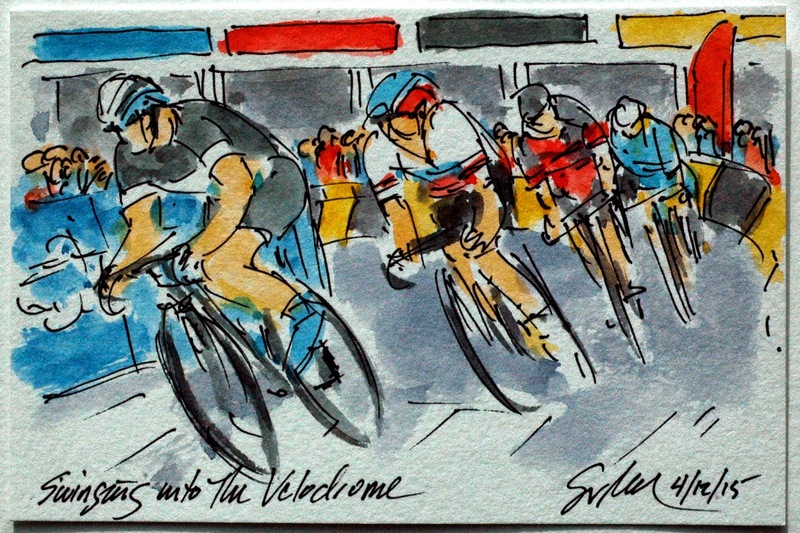 Etixx Quickstep made the final turn into the Velodrome in Roubaix with the advantage of numbers, I hesitate that they have been in this position before. It was Yves Lampaert playing the roll of sacrificial domestique for his teammate, Zdenek Stybar. Swinging in behind the Etixx Quickstep duo is the Belgium favorite, Greg Van Avermaet (BMC) follow closely by Lars Boom (Astana) and 3 others. Paris Roubaix always ends on the Velodrome, a smooth steep banked track after the notorious pave, it must feel like a treasure reward of 750 meters. Under the velodrome are the other reward, showers for victor and vanquished alike. Oops, I got myself out of order with this post. This one should have come before "The Next to Go" and after "Waiting on the Train". Each of the favorites that had remained upright and had made the decisive split had a dig at each other, testing their own legs and those of their rivals. 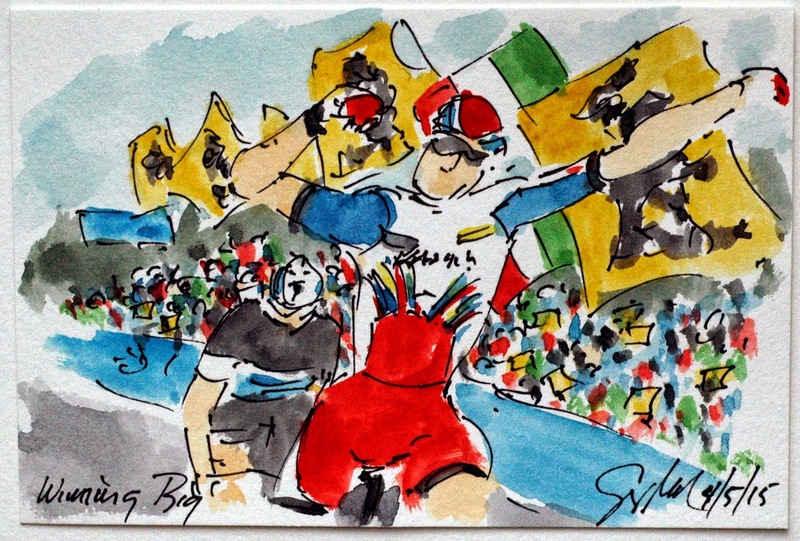 Peter Sagan (Tinkoff Saxo) adorned in his Slovakian National Champion jersey slipped away from Ian Stannard (Team Sky) and the rest as the winds blew and the cobbles rattled everyone's teeth. Greg Van Avermaet (BMC) and Yves Lampaert (Etixx Quickstep) had left the grasp of the peloton and it was John Degenkolb (Giant Alpecin) that was the next to go off in search of glory in Roubaix. Degenkolb has been enjoying great form and some nice additions to his palmares in the early races of the 2015 ProTour season. This was one rider that the peloton wasn't going to be happy to let go. The speed of the peloton would increase with each attack that came out of its ranks. 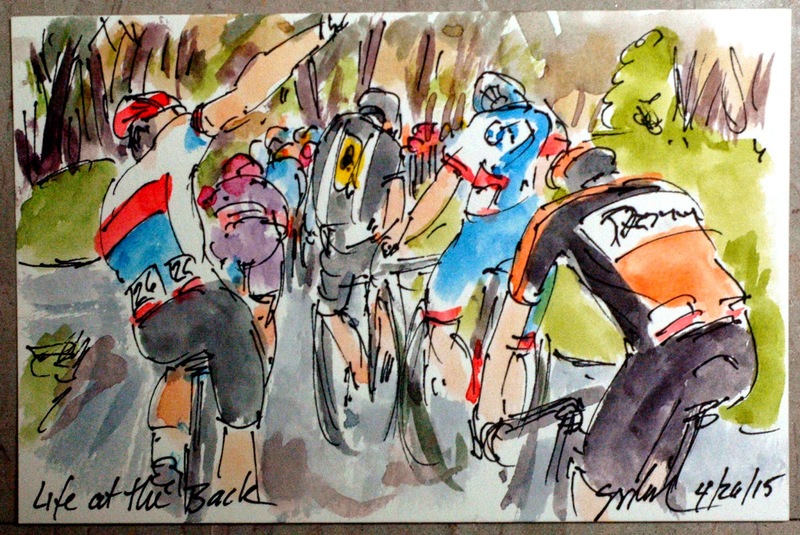 That speed and the length that the breakaway had been out in front ensured that they would be caught, eventually. The very last one to succumb to the charging peloton was the Frenchman, Alexis Gougeard (AG2R). Leading the chase when the catch was made was Borut Bozic (Astana) doing the work for his team's hopeful, Lars Boom. It was Boom who took the stage last year that included many of these same pave sections, and like Paris Roubaix, finished in the Roubaix Velodrome. The final catch was made with just 21 kilometers left to race, a valiant effort by Gougeard. 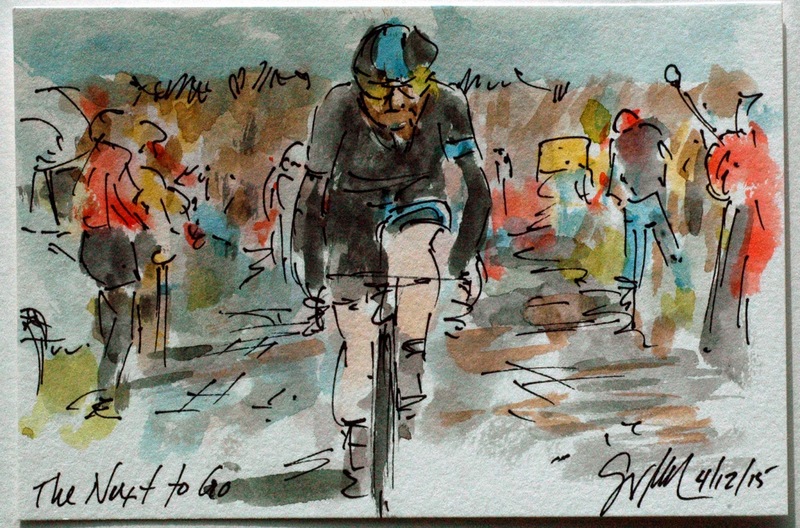 Sir Bradley Wiggins (Team Sky) made no secret of his desire to win his final race for his long term team. Wiggins will move away from road cycling after today and concentrate on returning to the track and the 2016 Summer Olympics. He will also be working with a new development team that he has created. Bearing that in mind, it was no surprise to see the former winner of the Tour de France and current World Time Trial Champion strike off in search of the leaders on the road through the blowing dust of the north of France. Professional bike racing is done on the open road. While the gendarme do all they can to close off the roadways, the trains still have a time schedule to keep. It seems that every year some group of riders are caught at a railroad crossing as the gates come down across the road. This year more riders than normal skirted around the gates trying to beat the train, which should call for disqualification. Instead those that went through as the gates began to close where held by the referee until this group rejoined them. At least for all involved, it was a TGV bullet train so the wait wasn't long at all. Not so good for those trying to join back on from behind. Some of those waiting impatiently included; Julien Morcie (Europcar), Yaroslav Popovych (Trek Factory Racing) and Dylan Van Baarle (Cannondale Garmin). Only one time every year is this stretch of pave open through the forest of Arenberg. Well to be fair, it was twice last year since the Tour de France covered the same stretch of cobbles in stage 5. Since team cars are diverted over the pave sections, team mechanics and soigneurs will stand along the road holding up wheels should their men need them. At this point the peloton is still 5 minutes behind the break away as they are led through the forest by Lotto Soudal and BMC. Tucked in behind the domestiques is Peter Sagan (Saxo Tinkoff) in his Slovak National Champion's kit. 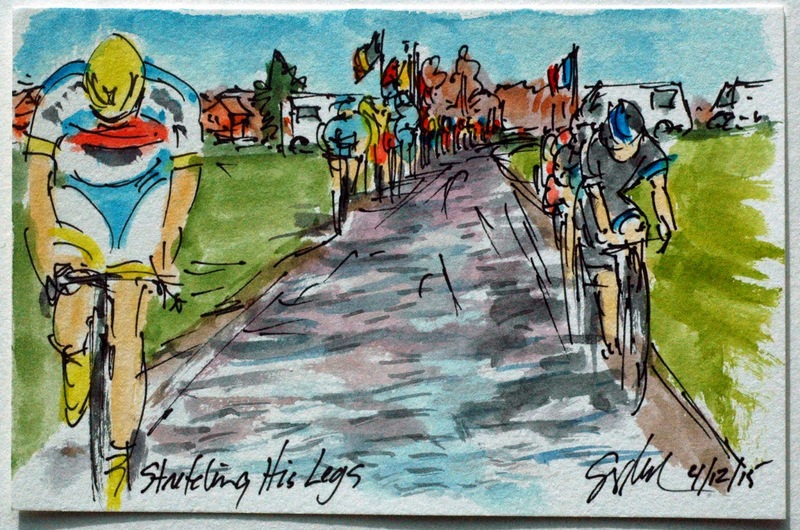 Mid April means it is time for the "Hell of the North" the fabled, Paris Roubaix. Over 300 kilometers of racing and 100 of those kilometers are over some of the roughest cobble stones in the world. This race is so known for those pieces of pave, that the trophy for the winner is a granite cobble stone. Quite a humble award for such a noble undertaking. The day had the early breakaway, originally numbering 9 riders that gained 9 minutes on the peloton before the chase began. This is the back of the break away as the rumble over an early section of pave. Alexis Gougeard (AG2R) follows Time Declercq (Topsport Vlaanderen) and Alexijs Saramotins (IAM Cycling) amongst the others as the group try and stay away from the favorites and the wantabes behind. This is a small original watercolor and ink painting that was created using Yarka St. Petersburg watercolors and Steve Quiller brushes from www.richesonart.com. They are a small family run art supply business in Wisconsin and have incredible great art making materials. This painting is available through my artist website at www.greigleach.com. To purchase this particular watercolor just follow the direct link at the end of this post. International shipping is available. Alexander Kristoff (Katusha) claimed his ninth victory for the 2015 season, it was also the ninth victory for Katusha. Poor Niki Terpstra (Etixx Quickstep) didn't have the legs to get away from the Norwegian and knew full well he would have very little chance of out sprinting the fast man from Katusha. Terpstra had ridden very smart forcing his rival to stay on the front for the final two kilometers, but even that didn't weaken the on-form Kristoff. The pair were also smart enough not to play to much cat and mouse strategies knowing full well that Greg Van Avermaet (BMC) and Peter Sagan (Tinkoff Saxo) were riding as hard as they could less than half of a minute behind. This is a small original watercolor and ink painting that is available through my artist website at www.greigleach.com. Just follow the direct link at the end of this post to purchase this piece of original art for only $50 USD. And yes, international shipping is available. 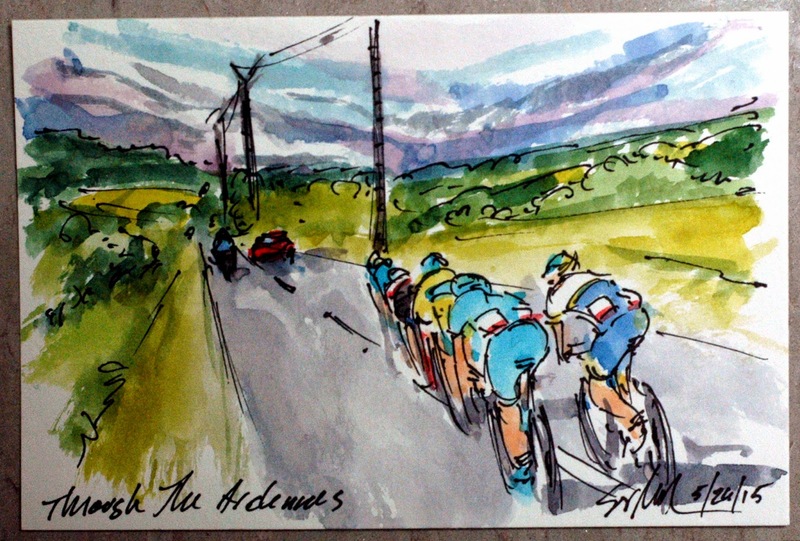 If you are enjoying discovering bike racing through my writings and paintings be sure to search out my recently published, "Book de Tour - Art of the 101st Tour de France" Just google the title to find it through your local online bookseller. It is available world wide so you should be able to avoid international shipping. 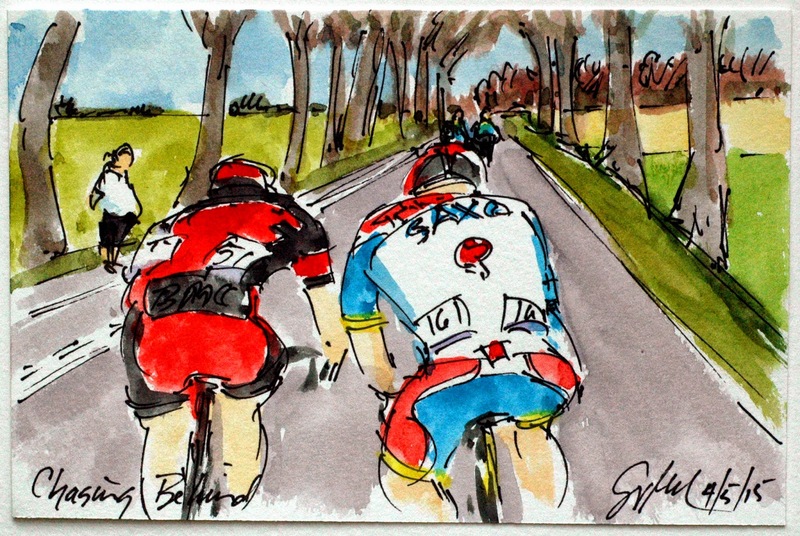 Greg Van Avermaet (BMC) was joined in the chase by Peter Sagan (Tinkoff Saxo) to catch the fleeing duo up the road. Sagan, racing for his new team, has yet to produce the results this season that earned him a very fat contract with Tinkoff Saxo. The team has been having an equally rough time in the early stages of 2015, so both could really use a victory to celebrate. Realizing their mistake in letting Alexander Kristoff (Katusha) and Niki Terpstra (Etixx-Quickstep) go, Greg Van Avermaet (BMC) jumped on the pedals on the Paterberg in hopes of chasing the pair down. Ever vigilante for his team, Zdenek Stybar (Etixx-Quickstep) marked the BMC leader's move, with Geraint Thomas (Sky) and Filippo Pozatto (Lampre Merida) jumping in behind Stybar. The Swiss flag (and many "We love you, Fabian" signs) were waved even though the three time Swiss winner of the race had crashed out of another race just two weeks earlier. While their man wasn't there, their spirits (or consumption thereof) was hardly dampened. As promised, it was the Paterberg where everyone made attempted to make their move, at least those who were still in contention. After Greipel had been pulled back into the fold, it was yet another sprinter to spring a surprise. First it was Niki Terpstra (Etixx-Quickstep), the winner of last year's Paris Roubaix, who got a jump on the dwindling peloton. However, it was the sprinter from Katusha, Alexander Kristoff, who covered the Etixx-Quickstep rider's move. The pair quickly distanced the others, looking to be the move of the day. They certainly have the power and the pedigree to hold off any of the chasers behind. Lotto Soudal has been riding the Ronde van Vlaanderen most aggressively. Lars Bak had been up the road earlier and they had three men in the front group after attacking the Paterberg. It was Andre Greipel (Lotto Soudal) who surprised the peloton (and me) by attacking on the lead up to the next climb of the day. 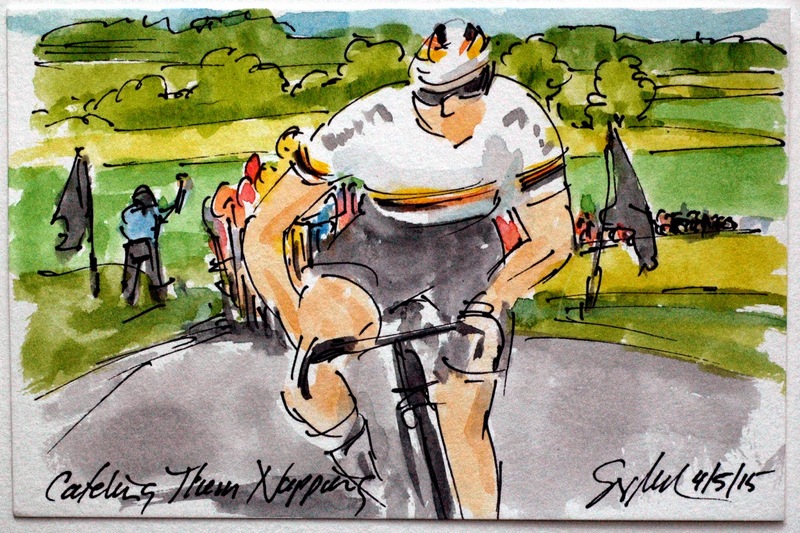 He caught them all napping and it was a surprise to see the big German National Champion sprinter attack on a steep ascent. For all of the classics in Belgium the farmers have been lining the roads with their tractors, although here it is just their black flags on the side of the road, to protest recent EU changes in agricultural regulations. Today was the first time that they disrupted the start of racing, usually, they just make tons of noise and wave their black flags. Lars Bak couldn't hang with the Frenchman, Damien Gaudin (AG2R) as they attacked the feared Paterberg for the first time. The cobbled climb plays a major role in many of the Northern Classics and the peloton would be climbing this tough steep berg three times today. Its pave should prove to be where the decisive move of the day would be played out. 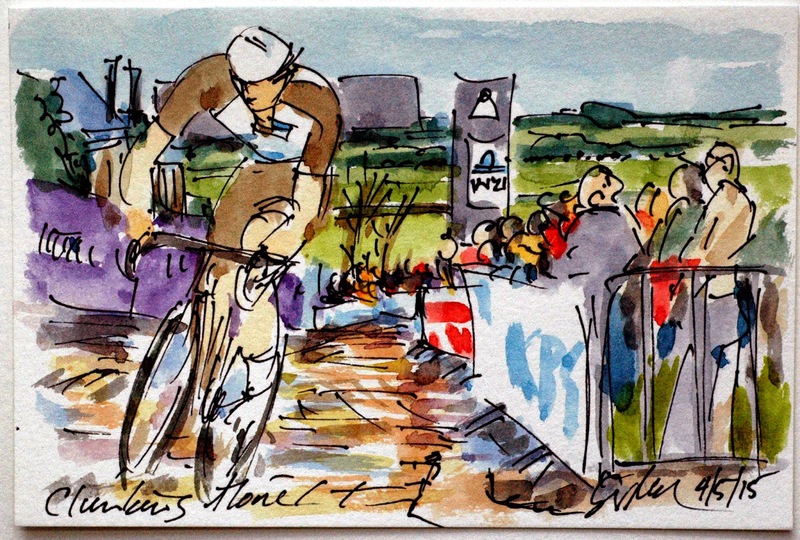 To paraphrase Phil Ligget, Ronde van Vlaanderen is a race with quite a sting in the tail. Virtually all of the climbing occurs in the final 70 kilometers of the long, frequently cobbled race of 264 kilometers. As per usual, an early break went off, but soon fell apart when these two, Lars Bak (Lotto Soudal) and Damien Gaudin (AG2R) road off the front and up the Kalanrieberg. This is a small original watercolor and ink painting that was created using Yarka St. Petersburg watercolors and Steve Quiller brushes from the family run art supply company, www.richesonart.com. In addition, this painting is available through my artist website at www.greigleach.com. Just follow the direct link at the end of this post to purchase this piece of original art for only $50 USD. And yes, international shipping is available.